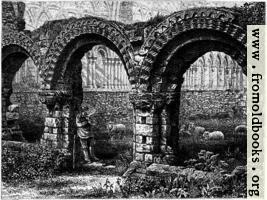 A man stands smoking his pipe in the ruined arch of this ancient abbey. Sheep gaze on are much away at the grass growing in the ruins of the cloisters. The man is presumably a shepherd, although it’s not clear that his walking-stick has the crook at the end that’s part of the trade. The zig-zags decorating the arch indicate that they may be Norman, although there was buildingin this area as far back as Roman times. 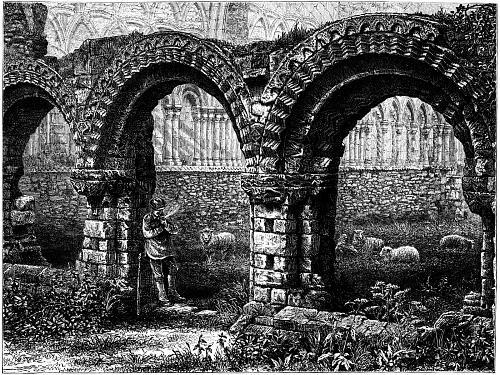 The monastery is said to have been destroyed or plundered by the Danish Vikings, presumably in the 9th century, but was re-founded much later. You can buy a print of this work on deviantArt.com.